Celebrate Flag Day (February 15) at George Stanley's childhood home - the home of Laurier Lounge. The George Stanley residence: The childhood home of the man who designed the Canadian maple leaf flag. The home located at 1111 7th Street S.W. was built in 1908 for the Stanley family, who consisted of John Henry Stanley, manager of the Stanley Paper Co. his wife Della and their child George. George Francis Gillman Stanley is well known in academic circles as a prominent historian and author. To the rest of Canada, he is known as the designer of the Canadian flag. He began his post secondary studies at the University of Alberta where he received a Bachelor of Arts degree. In 1929, he attended Oxford University as the Alberta Rhodes Scholar. While attending Oxford, he played for the Oxford University Ice Hockey team, and in 1931 the team won the Spengler. George returned to Canada in 1936 as the head if the history department at Mount Allison University in Sackville, New Brunswick. During World War Two, he joined the army and served as a Lieutenant with the New Brunswick Rangers, an infantry training officer in Fredericton and ended over seas as a historian at the Canadian headquarters in London. He became deputy director of the historical section and was discharged in Vancouver in 1947. The following year he came out of military retirement to help fight floods in the Fraser Valley and was on the Reserve of Officers until 1967. Dr. Stanley held the first chair in Canadian History at the University of British Columbia from 1947 to 1949. After being awarded a Guggenheim Fellowship he went to Ottawa in 1949 to research the history of the Canadian governmental policy dealing with native people. In 1949, Stanley went on to teach at the Royal Military College of Canada in Kingston Ontario, where he was dean of arts for seven years. He left RMC in 1969. At this point he returned to Mount Allison to become director of the first Canadian Studies program. While George retired from teaching in 1975, he continued to write and remained active in public life well into his nineties. In 1982, he became the 25th Lieutenant-Governor of New Brunswick and served until 1987. It was during his time serving as Lieutenant-Governor that Stanley met many members of the Royal Family as well as the Pope. In 1976, George was made an Officer of the Order of Canada and promoted to Companion in 1994. He has received a Knight of Justice of the Order of St. John, the Canadian Forces Decoration and twelve honorary degrees. This is in addition to his four earned degrees. He was a fellow of the Royal Society of Canada and of the Royal Historical Society. In 1983 he was made an Honorary Fellow of the Royal Heraldry Society of Canada. In 1950, he was awarded the Royal Society of Canada’s Tyrrell Medal for history. In 1955 he was elected as the president of the Canadian Historical Association. Perhaps his greatest contribution to Canada as a whole was the design of our current flag. The design of the red and white maple leaf was inspired by the simplicity of the Royal Military Colleges flag. Stanley wrote in 1964 that, “the new flag of Canada should be instantly recognizable, and simple enough so that school children could draw it.” At the bottom of a letter to the Honourable John Matheson, Stanley sketched the simple design. Stanley’s proposal was placed on a wall with thousands of other designs and eventually was chosen by the Liberal members of the flag committee. After being slightly modified by a government graphic artist it was officially adopted as Canada’s new flag by the House of Commons on December 15 1964 and by the senate on December 17 1964. On February 15 1965 the flag took effect after being proclaimed by H.M. Queen Elizabeth II. At the unveiling of the flag in Ottawa, George and his wife Ruth were present. George Francis Gillman Stanley died in Sackville, New Brunswick on September 13, 2002. The house is Reminiscent of Tudor Revival, which is often referred to as Picturesque Cottage. Some of the features of this style are the steeply pitched roofs and cross-gabled plans. This particular house has examples of ornamental half timbering, located on both sides of the house in the peak of the roof. The house is a one and a half storey wood frame structure with a brick foundation and a full basement. It has a medium gabled roof with asphalt shingles, clapboard siding, a single brick chimney and flat windows. There is currently one long dormer window on the front and two short dormer windows on the rear. Wood projecting eaves, moulded frieze, moulded soffits, and flat windows. The main entrance is located in the centre of the front façade, it is a single one panel door which is slightly recessed. NOTE: For a few years, the Calgary Heritage Initiative and friends in the Canadian Club of Calgary and the Historical Society of Alberta worked together to raise the profile of the G.F.G. Stanley house, as it might have been demolished the latest Calgary boom. There were several events on Flag Day and Canada Day, and a plaque was placed on the site. This news is in several different threads on the website. I am locking several of those threads and collecting the information here. On February 15 (2007) members of Calgary Heritage Initiative and the Calgary Chapter of the Canadian Club passed out flags in front of the Stanley House in the Beltline; the childhood home of the man who designed the Canadian flag (see above for information and photos). Watch for us on the TV news (CTV, CityTV, CBC) on Thursday and in the newspapers on Friday. We'll post also links and some photos here. 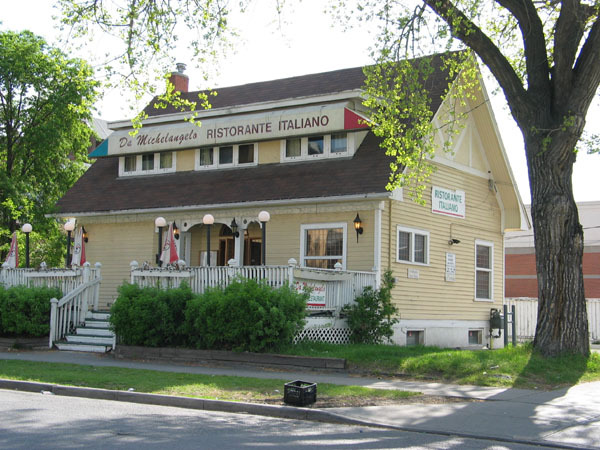 Good news - the owners of the "Laurier Lounge" on 17th Avenue have taken over the Stanley House on a 10 year lease. Look for the grand re-opening in the Spring. This is great news, and a good 'Canadian' business for the house. Last edited by newsposter on Sun Jan 17, 2010 1:32 pm, edited 2 times in total. The George Stanley birthday event on July 6 2007 was a great success. Thanks to Ruth Stanley and the Stanley Family, the U of C's Donald Smith, the Canadian Club of Calgary, the Historical Society of Alberta, and of course the organizers from the Calgary Heritage Initiative Society, particularly Tony Smith. A special thanks to Martin Maheux of the Laurier Lounge. Good luck at the new location! 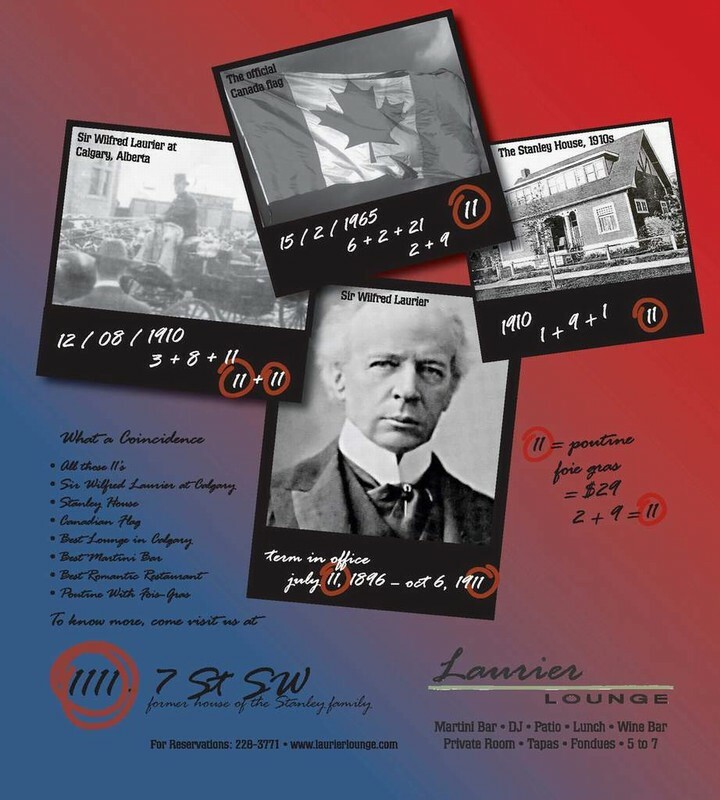 The next Stanley event is a tour of "George Stanley's Calgary", starting from the Laurier Lounge at 1111 7th Street SW, at 7 pm on Sunday July 29 2007. February 15th 1965 was the day the maple leaf and two red bars were officially raised on Parliament Hill as Canadian flags. 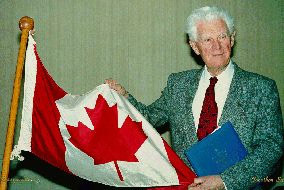 George F. Stanley, the designer of the current style of flag, was born in Calgary and lived at 1111 7th St SW for many years while he went to local schools, including Connaught and Central. He was later a Rhode Scholar for Alberta, Lieutenant-Governor of New Brunswick, Companion of the Order of Canada, and a widely recognized historian of Western Canadian history. On his death in 2002 his collection of writings and his library were donated to the University of Calgary, confirming a lifelong commitment and interest in the West. Most Calgarians are not aware of this link between our city and our flag. Attending the event, and available for interview, will be Ruth Stanley, the widow of Dr. George Stanley. She is visiting from her home in Sackville, NB. At the event, a plaque donated by the Calgary Heritage Initiative Society, The Canadian Club, and the Historical Society of Alberta will be unveiled. Last edited by newsposter on Sun Jan 17, 2010 1:45 pm, edited 1 time in total. 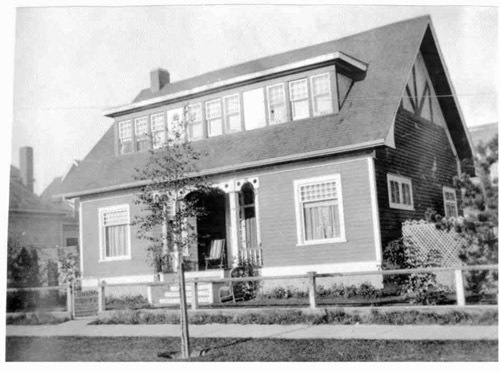 In 2009 the Stanley Residence was added to the City of Calgary heritage inventory as a City Wide Heritage Resource - significant to all of Calgary. This is not a "heritage designation" that would permanently protect the house, but it does provide the City with tools to encourage is retention. For more on the City inventory, go to www.calgary.ca/heritage. Excellent example of a living history! Really... Sometimes it's hard to believe that something can be preserved that long in such a good condition... More than 100 years!!! Happy Flag Day. February 15 is Canada's national Flag Day, celebrating the Maple Leaf flag designed by Calgary native George Stanley, who grew up in the house at 1111 7th Street SW, now home to the Laurier Lounge. CALGARY - When Warren Buffett comes to town, a dining request is simple: a quiet room, a bit of history and a good burger on the menu. I'm surprised they allowed commercial business in to this location. Is it also true that during renovation some structural foam was used to replace some of the aging materials in the building. In America I know that changes like that can revoke status as a historical building, but Canada may have different rules. Last edited by RedAndWhite on Mon Apr 11, 2011 11:02 am, edited 1 time in total. It is a very mixed use area, and very high density. North of 12th Avenue it is more commercial than residential. A low density house would never survive here as a residence, more economically sustainable as a business - that's "adaptive reuse" for you!. This house has had commercial uses for many years.